• If a cancellation/amendment is made within 72 hours (in Hanoi) including reservations made within that time, 1st night’s room rate and tax will be charged. • In case of no-show, 100% of room rates and tax will be charged. • Early Bird/Long Stay/Last Min/Package Rates are non–refundable. The refund process will take approximately 7 to 20 working days depending on the intermediary bank. • The room and taxes must be paid prior to check-in. The hotel reserves the right to release the rooms in which the credit card set as a guarantee has been denied. • All Promotional rates are exclusive of 10% tax and 5% service charges. • Early check-in: subject to room availability. • Children under 4 years old sharing the bed with parents is free of charge. (No extra bed provided, maximum 01 child). • Children from 4 to 11 years old at the time of travelling, sharing the room with parents, will be charged for breakfast (No extra bed provided, maximum 01 child). • Children from 12 years old and over are considered as adults. • If cancellation/amendment is made within 72 hours (in Hanoi) including reservations made within that time, 1st night’s room rate and tax will be charged. • In case of no-show, 100% room rate and tax will be charged. The refund process will take approximately 7 to 20 working days depending on the intermediary bank. Please notify us at info@ccentralhotels.com when you receive your money back. CCentral Hotels accepts no responsibility for any loss, injury, damage or delay due to natural disaster, politic actions, weather or causes beyond its control. Travel insurance and medical precautions are essential. Your travel insurance must provide cover against personal accident, medical expenses, emergency repatriation and personal liability. We strongly recommend that you take out travel insurance at the time of booking. 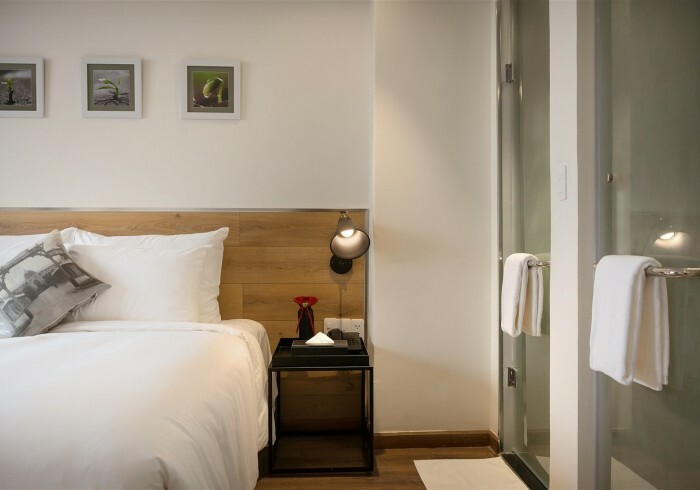 Situated within the lively Bui Vien neighborhood, C Central Hotel offers sleek and modern accommodation in the heart of Hi Chi Minh City’s, District 1: a great place for nightlife, food and shopping. It is within walking distance to famous landmarks, including Ben Thanh Market and Fine Arts Museum, many bars and restaurants, shopping centres as well as historical and cultural attractions. Adorned in delicate shades of cream with hints of light brown, each air-conditioned room is equipped with a cable TV, a personal safe and a minibar. Tea and coffee making facilities and complimentary bottled water are also provided. En suite bathroom comes with a hairdryer, shower facilities and free toiletries. Certain rooms offer a bathtub. There is free WiFi in all rooms and common areas. CCentral Hotel offers currency exchange, laundry and dry cleaning services. Guests can also enquire about local attractions at the tour desk, and book tours and transportation directly at the hotel. There is a 24-hour front desk with English-speaking hosts. Guest can enjoy the on-site restaurant and bar. Reunification Palace is only 1.1 km away, while City Hall is 1.3 km away. The hotel is 7 km from Tan Son Nhat International Airport.